Bishop Amat junior Jessica Gallardo was the SGV’s top performer in Week 6, leading the way with her 800/1600 double at the big Trabuco Hills Invitational. Jessica took the SGV seasonal lead with her 5:03.53/6th finish in the 1600 that ranks her 20th All-Time among SGV performers. In the 800, she was 2:15.96/3rd, and is now 23rd AT SGV and second best on the season behind Claremont soph Annie Boos. In other SGV leading performances at Trabuco, Kayla Richardson (Walnut, Jr) improved to #20 AT SGV with her 56.53 win, and SGV Defending Champ Ally Palomino (Amat, Soph) moved to #25 with her 11:03.31/2nd. California soph Lauren Anderson set a school record with her 119-04/6th placing in the discus. Arcadia’s 47.68 4×100 relay win at the Spartan Relays improved their school record and took them to #20 AT SGV, while Kylie Eagon (Ayala, Sr) joined two others in the SGV high jump lead with 5-04 effort at the Covina Invite. These athletes are among thirteen individuals and relays that met the new All-San Gabriel Valley Standards this week. These standards were created to award excellence in each event, measured against an objective standard. The standard is 102% of the mark of the 100th best performer in California in 2014. The strongest events for the SGV girls have been the 400, 100 hurdles and long jump, each with six performers meeting the SGV Standard, and at least one girl has met the standard in every event. Jessica ran a 2:14.66 800 this year at Occidental College. 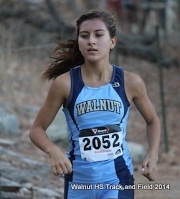 Her oustanding times at Trabuco Hills were despite only a 90 minute rest in between races. Wow – just 90 minutes! I saw the time from Oxy, but we’re not including marks achieved in open races. But I’m sure she’ll run faster in before the year is out.